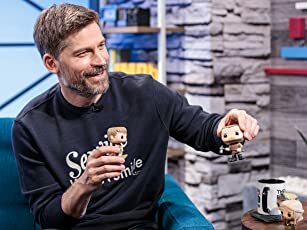 Learn how to play the "The Tickle Game" as Jon Hamm, Jeremy Renner, and their Tag castmates reveal their favorite childhood pastimes. 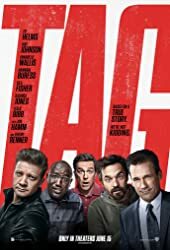 Childhood friends Jerry (Jeremy Renner), Callahan (Jon Hamm), Randy (Jake Johnson), Sable (Hannibal Buress) and Hoagie (Ed Helms) have been competing in the same game of tag for 30 years. When Jerry gets married, he attempts to retire from the intense annual game without ever being "it," causing the other four to band together and go to extreme lengths to finally tag him. Directed by Jeff Tomsic. Inspired by the Wall Street Journal article "It Takes Planning, Caution to Avoid Being It." Q: What is 'Tag' about? Q: Is 'Tag' really based on a true story? 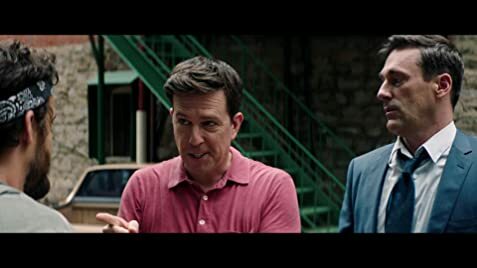 One of the more random true stories to be adapted for the big screen in recent times, Tag is for all intents and purposes an extremely silly and over the top comedy but one that knows and understands what it is and is all the better for it. 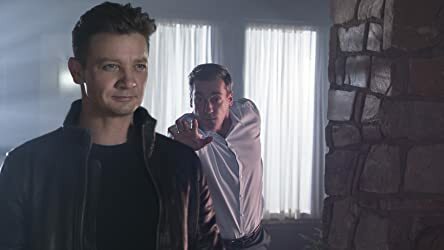 Directed by first time director Jeff Tomsic and featuring an all-star cast led by Jon Hamm, Ed Helms, Jake Johnson, Hannibal Buress and Jeremy Renner, with help from the underused female supports Isla Fischer, Annabelle Wallis, Rashida Jones and Leslie Bibb, Tag is quite literally a film about a bunch of adults trying to beat each other at the game we here in Australia call chasey/tiggy but it's also a subtlety affecting examination on friendship and finding reasons to remain in each other's life, which makes Tag become such an enjoyable watch from start to finish. Based on the original Wall Street Journal article published in 2013, Tag features little titbits of the real life story its based upon but recognising the absurdity of the real-life game played by a group of long-term friends one month every year, Tomsic and his cast aim for the over the top and deliver and ensure that Tag never takes itself too seriously, which allows us as an audience to accept what we are in for and go along for the constantly moving ride. Focussing its attentions on Helm's determined Hoagie, Hamm's self-assured Callahan, Johnson's no-hoper Chilli and Buress's mild-mannered Sable trying their best to "tag" Jeremy Renner's champion player Jerry before he gets hitched and retires from the game as the uncatchable player, we are thrust into a series of completely over the top yet often hilarious high-stakes scenes of attempts to catch-out Jerry and the film's ability to craft an energy and frenetic nature to these moments really stands out as the does the cast's ability to build up a solid chemistry together. Led by Helms and Hamm who are both having a real blast in their respective roles, everyone gets a moment to shine here with supporting players Fischer and Renner both stealing the MVP chocolates with their fun turns and come the films surprisingly touching finale you begin to realise that you've grown attached to these characters despite the silliness and mayhem that surrounds them. If dumb comedies aren't your thing, Tag is a film to run very quickly away from but for anyone that heads into this hilariously true tale with the right mindset, Tag will become one of the more easy to enjoy and likeable comedies released this year and a likely inspiration to get your old chasey buddies together for one last game.